There are now well over a million mobile applications in both Google Play and the iTunes App Store alike, and growth of those app marketplaces shows no sign of slowing down. However, according to new data from Nielsen out this morning, there may be an upper limit to how many apps people will interact with over the course of a month, and that number – just over a couple dozen – hasn’t grown much over the past few years. That’s good news for the everyday must-haves, like Facebook and Google or the default email, messaging, maps or weather applications, for example. But it’s bad news for the young companies trying to establish a foothold and core group of dedicated, engaged and loyal users within the ever-expanding app universe. According to Nielsen, U.S. iPhone and Android users over 18 have been increasing the time they spend using mobile applications, which is up 65 percent over just two years ago. In the last quarter of 2013, for example, users spent 30 hours, 15 minutes using apps per month. That’s a full half-day more than the 18 hours, 18 minutes they spent per month in Q4 2011, the new report notes. What’s interesting is how little the number of apps used per month has changed over this same period of time, however. 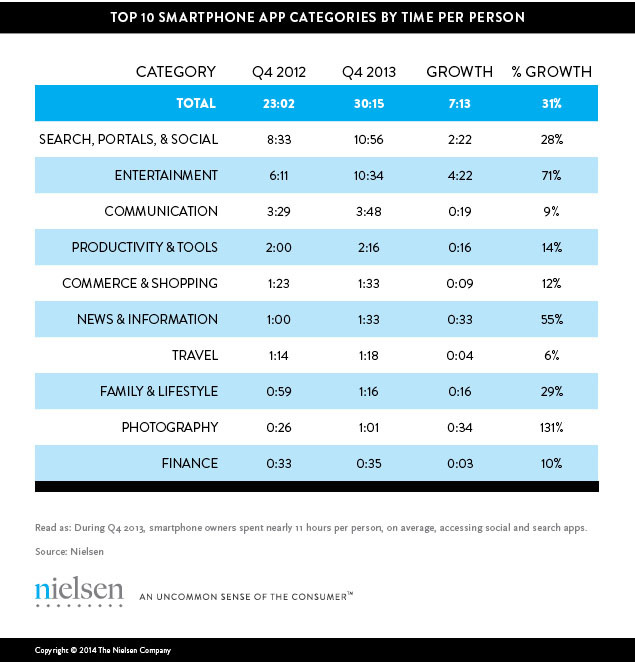 In Q4 2011, the average number of apps used per month was 23.2. The following year (Q4 2012) it grew to 26.5, and as of Q4 2013 it was just 26.8. Says Nielsen, this appears to indicate that there may be an “upper limit” to how many apps users will engage with each month. Of course, those apps being used may not always be the same ones every month, as evidenced by the onslaught of new gaming releases to choose from on any given day, for example. Users are often playing, then disposing of, old titles in favor of new ones on a regular basis. And these days, the hit-driven nature of mobile gaming seems to be seeping over into other areas of the App Store as well, where trending, buzzed-about hits are not always of the “Flappy Bird” variety, but are sometimes just goofy apps we’ll all talk about for a few days, like Yo, then forget. Nielsen found that social networking and search apps still dominate the time we spend in smartphone applications – even more so than games – accounting for nearly 11 hours per month as of Q4 2013. Gaming and other entertainment (including video and audio) grew 71 percent year-over-year to account for 10 hours, 34 minutes. All the other app categories also saw growth in time spent over the past year, but Photography apps really blew things away with a 34-minute or 131 percent per-person increase over the year prior. 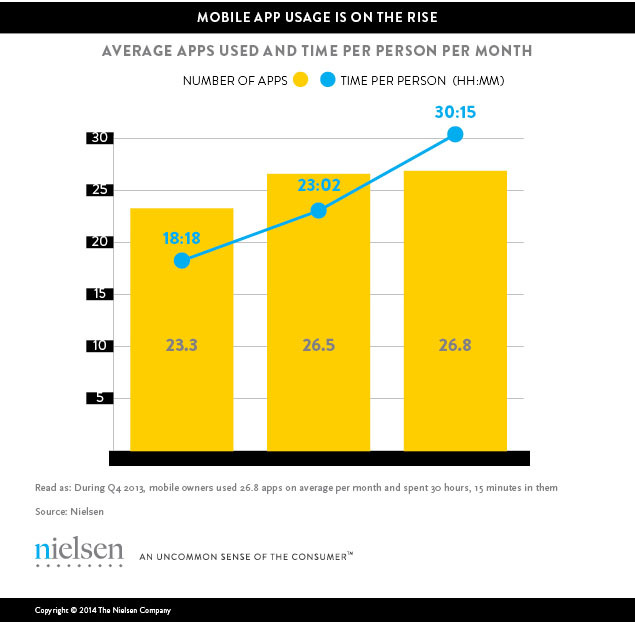 Nielsen additionally examined how app usage and time spent varies by age, and found that older smartphone owners (ages 25-44) use more apps, averaging 29 per month, but younger users (13-24) spend the most time in them, with 37 hours, 6 minutes in apps per month. That makes sense, given that younger users aren’t likely as tied down by other responsibilities with either their jobs or their families. They’re still working their way up the ladder at work, and fewer will have their own children to parent and worry over at their age. 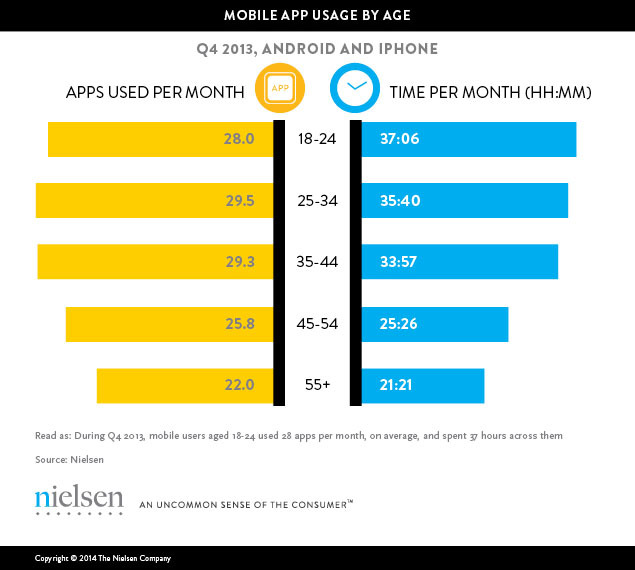 That being said, notes Nielsen, even though older users may not have as much time to spend using apps per month, that usage is still quite significant. For instance, those aged 55+ today spend more than 21 hours across 22 apps per month. It’s this kind of trend that’s having an impact outside of the app universe as well, as apps have begun to eat into the time we would have spent on other leisure activities, like reading books or watching TV. The question for mobile companies today is no longer just how to get installed, but how to become one of those some half-dozen apps that gets used monthly.